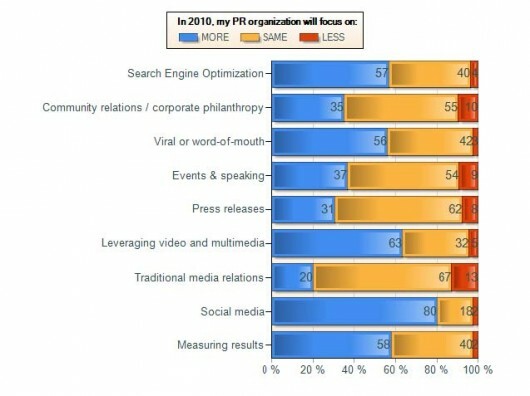 A new whitepaper from Vocus with their 2010 PR Planning Survey results has some encouraging statistics about the increasing role of search engine optimization in the overall PR mix. That’s good news, because even just 2-3 years ago many companies’ efforts to integrate SEO and PR activities did not extend much beyond press release optimization. That’s certainly important but it’s just one tactic; there are a lot more opportunities to explore. Greg Jarboe and Lee Odden are at the forefront of evangelizing the importance of SEO in public relations and in teaching how to actually implement integrated efforts. Both rightly deserve credit for increasing awareness industry-wide. News monitoring and online media databases have traditionally received the lion’s share of PR tool spending. Over time I’d expect to see social media monitoring tools grab more budget at the expense of both, as more and more focus is placed on direct communication with target audiences. 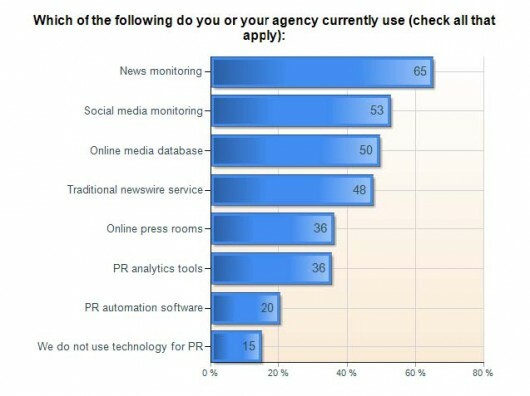 I was surprised to see only 36% of respondents are using online press rooms, since that should be a fundamental part of any corporate website. Perhaps some of the respondents took the question to mean third-party online press room services.